There’s no doubt that it makes sense to invest in some decent travel insurance before you jet off on your holidays – there are so many problems that can arise, from inclement weather to medical emergencies or even just simple cancellation. When you’re on the hunt for the right policy, however, you need to bear in mind some of the unexpected things that are often not covered. Things like adrenalin junkie sports – skydiving, free-climbing, scuba diving, mountaineering – are understandably an issue for some insurers, but not a lot of people know that expectant mothers whose pregnancy arises through IVF can also face barriers. Assisted reproduction features on many insurers’ lists of exclusions for international travel, and while it is possible to secure cover, there are often stipulations and premiums to be paid, and mothers-to-be with a multiple pregnancy (twins, triplets etc) through IVF may find that they can’t secure cover at all. So, what can be done? If something is generally not covered in travel policies, you could spend some time looking for a specific company that makes an exception. Otherwise, the most important thing for travellers to remember is to carefully read all of the small print attached to their policy. It may not make very interesting reading, but it could well turn out to be the most profitable holiday read you ever embark on! CANSTAR has recently crunched the numbers to determine who offers outstanding value for money when it comes to travel insurance. We have looked at 55 policies across three traveller profiles (Single, Couple, Family) and including five regions (Australia, Asia, Europe, the Pacific and the Americas). 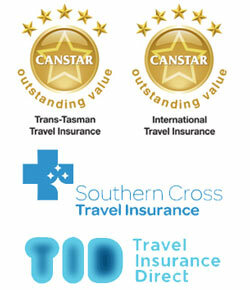 This year, we are pleased to announce two winners – both Travel Insurance Direct and Southern Cross Travel Insurance are winners in the two categories: International Travel Insurance Award and Trans-Tasman Travel Insurance Award. Both of these providers offer competitive premiums, with TDI winning five stars across all of the profiles and boasting some great features, including a 24-hour helpline that you can reverse-charge call. Southern Cross has some excellent features, too, including up to $100,000 cancellation and loss-of-deposit cover – which includes travel agent cancellation fees. The full CANSTAR Travel Insurance Star Ratings report for April 2014, which details is available for consumers to download at on our website.